Russia Today Reports: Libya’s interim leaders claim they will not stay in power once the last Gaddafi strongholds are defeated. But Patrick Henningsen, a managing editor of the 21st Century Wire news site, believes that the interim government will stay on long after that. Nevertheless, Henningsen says there is a huge power struggle within the Transitional National Council. NATO has vowed not to end operations in Libya until civilians are no longer in danger. 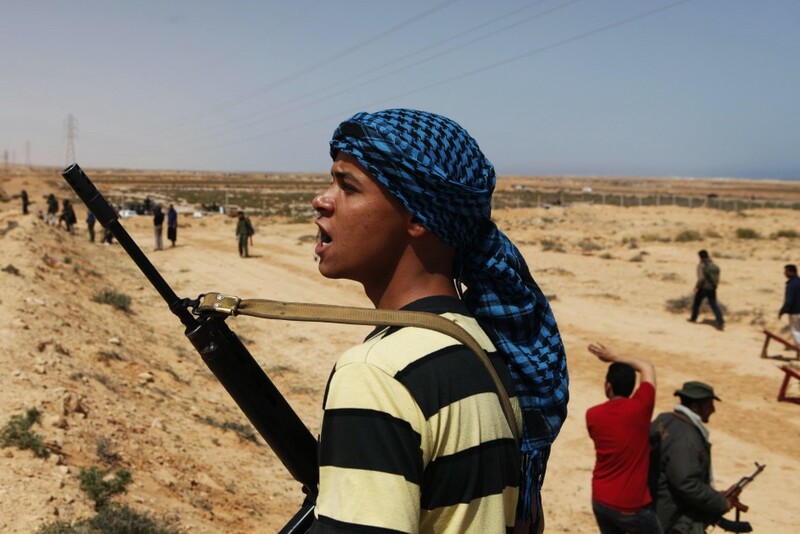 With thousands fleeing Sirte and Bani Walid because of shelling and water shortages, Henningsen believes the operation will continue until Gaddafi’s last strongholds are emptied of civilians and razed to the ground. But Libya has little chance of growing into a full democratic state, Henningsen says, because the “seeds” planted by NATO’s support for the rebels were not exactly democratic. He believes that the West is just carving up Libya, and the only stability it is really interested in is if it is stable enough for Western companies to come in and sign profitable contracts. Watch Russia Today News tonight at 6pm BST (GMT) as Patrick Henningsen, Editor of 21st Century Wire, discusses live on air the recent riots and violence in London and throughout the UK over the past 72 hrs. You can watch it live or later on demand at http://rt.com/on-air/. UN AND NATO: Taking sides in Libya's civil war to bring Libya under the globalist system. Tune in to Russia Today at 8pm GMT(BST) this evening as Patrick Henningsen, Editor of 21st Century Wire talks with News Hour about the Libyan Rebel’s ‘Oil for Arms’ trade and the international implications of NATO’s proxy war in North Africa. Watch on the live stream online at http://rt.com/on-air/. As Washington and the CIA scramble to shore-up their official narrative this week, it is reported that “Al-Qaeda” has confirmed the death of its leader Osama Bin Laden, according to a statement attributed to the group. Following predictable intelligence agency protocol, this scripted statement was posted on a series of seemingly random “jihadist” internet forums. This latest dubious Al Qaeda broadcast is timed to perfection and reads like a bookend to the White House’s grand proclamation earlier this week. The statement said that Osama bin Laden’s blood would not be “wasted” and that al-Qaeda would continue attacking the US and allies. In addition, the alleged Al Qaeda message goes on to say that Bin Laden’s death would be a “curse” for the US and urged an uprising in Pakistan. As is the case with most western manufactured Al Qaeda messages, this one should also be read as a hint to a future move on the part of the Washington-London-Tel Aviv axis, one which may see Pakistan as a new potential NATO military conflict opponent. Assumptions layered on top of lies, layered on assumptions. The fiction now surrounding the life and death of Osama Bin Laden has reached epidemic proportions, and now Washington is scrambling to hold its fragile story together. So it’s time to ask ourselves, what do we actually know about him, and what is pure fiction? 1) Osama bin Laden was a well known, well paid CIA intelligence asset used over a long period by more than one US administration to fight their proxy wars. Originally he was recruited during the end of the Carter administration to fight the Soviets in Afghanistan, he was subsequently used and armed to bolster the Muslim cause where it could be applied as a proxy force in civil wars, including Bosnia in the 1990’s. 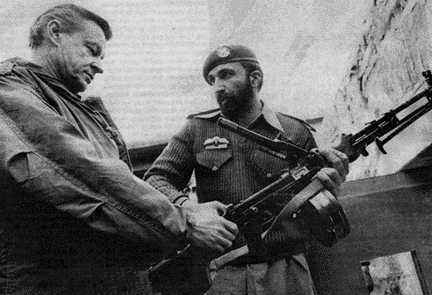 BEDFELLOWS: Osama bin Laden and Zbigniew Brzezinski in Afghanistan. 2) On several occasions in the 1990’s (by which time his name was increasingly linked to, but never proven to be responsible for several terrorist attacks), there were opportunities to arrest him, and on each occasion intelligence services interceded on his behalf either directly, or as was the case during the Clinton administration, the case against him was dropped due to a lack of evidence. 3) Though he was claimed by Washington to have “gone rogue”, the rest of his family remain as one of the best established and most westernised of the super-elite Saudi families who have married into British high society. The bin Ladens are linked to the Bushes and have been majority share holders in world foremost transnational arms and development consortiums of the Carlyle Group, whose directors include former US President George Bush Sr and former British PM John Major. 4) There have been numerous reports of Osama bin Laden’s death, including announcements by Heads of State on several occasions. On December 26, 2001, Fox News reported on a Pakistan Observer story that the Afghan Taliban had officially pronounced Osama Bin Laden dead earlier that month. According to the report, he was buried less than 24 hours later in an unmarked grave in accordance with Wahabbist Sunni practices. On January 18, 2002, Pakistani President Pervez Musharraf announced quite bluntly: “I think now, frankly, he is dead”. In October 2002, Afghan President Hamid Karzai told CNN that “I would come to believe that (Bin Laden) probably is dead”. A number of other official admissions can be found here. In total, this latest announcement by Obama would be the ninth time bin Laden has been pronounced dead. 5) Al Qaeda is not a genuine organisation, as it was invented by the FBI, CIA and promoted by western governments to sell their global war on terror. Video: How enemies Bin Laden and Al Qaeda were invented by the West. 1) There is no evidence, other than anecdotal and innuendo, whatsoever linking him directly with 9/11. 2) No evidence exists that he has been alive since late 2001. Although a number of videos and audio message have been released by CIA and Pentagon-run media offices, namely Intel Center and SITE, all subsequently proven to be poorly crafted fakes, no real evidence has ever surfaced. The most infamous of these fake tapes was the one which appeared just before the 2004 election, one that both Bush and Kerry attributed to George W. Bush gaining re-election that year. 3) There is no evidence he was ever in the ‘compound’ building in Pakistan’s Abbottabad Valley on May 1, 2011. Certainly, there is no evidence, other than the official statement from Washington this week, that he was killed then and there. As a long time western intelligence asset, Osama agreed to be the fall guy for 9/11 in exchange for safe passage and the continued patronage of his family which include a number of multi-billion dollar contracts from major Anglo-American-Saudi contractors. In death, as in life, he continues to do the bidding for his intelligence Puppet Masters, who still continue to use the utterly meaningless, catch-all term “Al Qaeda” to justify imperialist, dictatory and globalist policies, and subsequently announcing their endless agenda of grotesque plans. Critically acclaimed author and former US intelligence operative Steve Pieczenik, gives a complete analysis on the legend of Al Qaeda and Osama Bin Laden here. Washington’s announcement this week that it will not be releasing bin Laden photos is simply down to the fact that there are no genuine photos of his alleged assassination by US forces. To make this tale even more incredible, President Obama claims that Osama’s body was dumped into the Arabian Sea ten hours after he will killed. 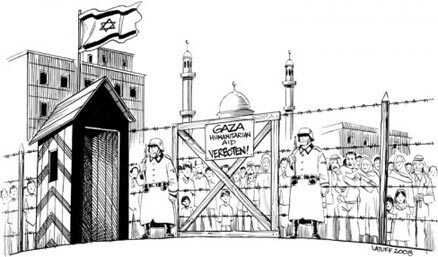 The ruling elite are promoting the irrational fear of terrorism to control populations. So what do we have? No body, no photos, no video… no evidence. But the official narrative moves forward like a Hollywood script, “a brave team of Navy SEALS carried out a daring operation to capture and kill the world’s number one terrorist”. And for the first night in ten years, Americans can go to bed feeling proud and safe. Clearly, a fictional character like Osama bin Laden was worth more alive than he was dead, which explains the lengths which Washington was willing to go in order keep his presence in play. The decision by the White House to cash in their big chip this week is likely due to a dire need for domestic approval in the run-up to the 2012 election, bury the birth certificate problem, re-spin unpopular foreign occupations in Afghanistan and Iraq, and to help sustain an expensive and ultimately useless hyper-security state. Obama’s latest propaganda stunt is the equivalent of the Holy Grail in terms of 21st century Anglo-American politics. But as well packaged as his delivery of this event appeared on Sunday evening, the fairy tale of bin Laden appears to be unravelling faster than his relatively inexperienced White House spin doctors can manage. The Bin Laden-Al Qaeda-911 Psy-Op which began under George Bush Jr and the Neo-Con establishment was inherited by the current administration, who are struggling to streamline their complexed story well enough for the public to resubscribe to it. Perhaps the best strategy for the Obama Administration would have been that of the Bush Administration- to leave the major fictional villain of our epoch, Osama bin Laden… safely buried in the closet. Wheeling him out now will mostly certainly start of chain of events that even the most skilled White House media minions will find difficult to patch up. The damage that this fairy tale has done to the US- and continues to do, threatens a number of major fundamental pillars and institutions domestically and overseas. The official narrative is easy to believe if you choose to switch off your critical faculties, and allow the Washington spokespeople and media moguls to take over, directing you what to think and when to think it. Conversely, sifting between the truth and the lies… requires effort. Wile believes that Bin Laden has not been the main threat to the world. Moreover, “people will be resistant to forceful intrusions into their backyards in order to make them believe any concepts or philosophy behind the assassination of Bin Laden. And this refers not only to people in those countries where the US military-industrial complex is busily going about spreading democracy, but also around the world and in the US itself. The retaliation will continue,” Wile says. Watch Anthony Wile’s interview on RT. The elimination of Al-Qaeda‘s leader will not facilitate the pull-out of US troops from Afghanistan, Wile believes. “The forces that are on the ground, these globalist forces that have the intent of bringing in line the various nations and states that need to be molded together in order to create a globalist government, they will continue their efforts, whatever it takes – force or propaganda through the mainstream Western media sources or the subversive movements of the CIA,” says Wile. “Americans should be more concerned with their own government and growing authoritarianism which is mounting within the US and the soft police state that is being imposed,” concludes Wile. Yet again, the alternative media has proven that it remains ahead of the corporate media’s analysis curve, leaving pundits at FOX, CNN, MSNBC and every major newspaper still scratching their heads. On Wednesday, the White House validated 21st Century Wire’s prediction as President Barack Obama stated that he will not to release any of the photographs of “the deceased Osama bin Laden,” according to White House Press Secretary Jay Carney. 21st Century Wire beats Obama to the punch by predicting no photo evidence would be produced. Official news report on Washington’s missing evidence of bin Laden’s assassination. For those who follow the news via alternative sources, this incident will come as no surprise, but this scoop speaks volumes. With daily budgets in the millions, audiences should seriously question whether the corporate mainstream media are up to the task and still deserve to their lofty titles “free press”, and “watchdog”. Meanwhile millions of viewers a day are migrating away from the major networks and newspapers, opting instead to pursue their own credible content and independent analysis online.